After completing this learning path, the badge earner understands 12-factor apps and how microservices are managed with the IBM Cloud Kubernetes Service and Istio. The individual understands containers, Kubernetes, and how to deploy containerized apps. The earner can also deploy microservices in a cluster and knows how to connect, manage, and secure those microservices. 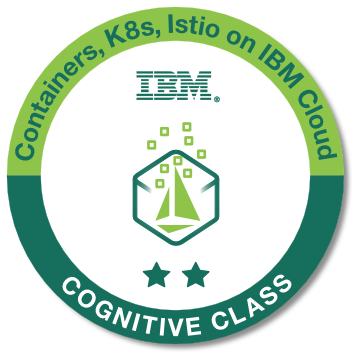 Earn the Beyond the Basics: Istio and IBM Cloud Kubernetes Service badge. Earn the Getting Started with Containers on IBM Cloud badge. Earn the Getting started with Microservices with Istio and IBM Cloud Kubernetes Service badge.